This week at PopMatters, I wrote about my search for self-awareness in otherwise earnest games. I’m a big fan of games that toy with the fourth wall, and I think it happens more often than we think. Even games that aren’t outwardly comedic or satirical wink at the player in order to acknowledge design limitations, common narrative or mechanical tropes, and the culture of games in general. In fact, I think that big-budget games designed to appeal to a wide audience are quite interesting to study in this regard. Since “triple-A” games need to be accessible and profitable, they hide their subversive, self-aware traits in places only the more observant players will see. Part of this essay references my silly experiment in counting the casualties in Uncharted. Nearly a year and a half later after writing it, I still look back fondly on that post. 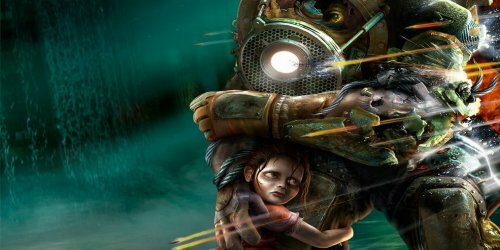 That essay in turn owed a great deal to Clint Hocking’s landmark piece on ludonarrative dissonance in BioShock. It’s an important piece in games criticism, but after all these years I still find myself disagreeing with Clint’s fundamental reading of BioShock. I think that the environment, narrative, and reward system in regards to saving or harvesting sisters presents a clear value-judgment on behalf of the game. The authored themes and mechanical systems seem to argue that while Objectivism may be the path of least resistance, it’s ultimately the road to perdition. I’m much more sympathetic to the idea that ludonarrative dissonance crops up after the climactic scene with Andrew Ryan. Based on Levine’s comments and the essentially traditional design philosophy of the game, I think those who worked on BioShock knew about this problem but simply didn’t have the time or the means to fix it. Instead, they chose to soften its harsh effects: using the story to acknowledge the gameplay sacrifices was a nod to the players that care about such things. It would take another whole essay to properly flesh out this argument, so I’ll spare everyone and stop here. In the essay, I also try to redeem the much-maligned Tingle. Despite how annoying he is, I've always been slightly amused at the larger implications of his character. Try not to think less of me, but I hope he finds his way into the forthcoming The Legend of Zelda: Skyward Sword. I’m interested to hear about other games that may contain subtle winks. Such signals are difficult to find and highly subjective, but I think the search itself is a large part of the fun.